One of the reasons why people can justify delaying getting help for their addiction is that they feel unable to afford rehab. It is true that this type of treatment can be expensive, and in many instances this will be the best option to help the individual enter recovery. There is a great deal of variation when it comes to the cost of alcohol rehab, and it is still possible to find reasonably priced options. The individual also has to keep in mind that this investment in their life will more than pay for itself in the years to come. In fact the money saved by not using alcohol or drugs will soon cover the costs of even an expensive facility. It is also usually the case that these rehabs will offer an easy payment option – it may not be necessary to pay all the fees right away. Those individuals who really don’t have the money for this treatment may be entitled to state funded rehab. * Hazelden is one of the most famous addiction treatment providers in the US. They currently charge $28,000 for inpatient treatment (usually 4 weeks) or $10,000 for outpatient treatment. * Promises Rehab in Malibu California if a favorite among celebrities. Their inpatient program currently costs about $33,000 for one month. * Passages is also based in Malibu California and offers a non-12 Step approach to addiction recovery. The current cost of treatment there is about $45,000. * Meadows Clinic in Arizona charges approximately $1,000 per day. The less well known rehab facilities will usually charge less, but it can be difficult to find anything under $10,000 these days. * The Top of the World Ranch Treatment Centre is located in the Canadian Rockies. This facility offers a thirty day accelerated program for 13,950 Canadian dollars (which works out at about $13,951). * Habitude offers a holistic approach to addiction recovery. This facility is based in Hamilton, Ontario and their programs start from $14,900. * The Priory is one of the most talked about rehab facilities in Europe. It is located in Roehampton, England and currently charges approximately $4,700 per week. * The [Rutland Centre] in Ireland charges 11,500 Euro ($15,000) for their 5 week program. * The Nova Vida Recovery Center is based in the Algarve Portugal. Their 32 day treatment program costs 15,750 Euro ($20,000). An increasing number of people are looking forward afield for addiction treatment. For some people the motivation for this will be to find quality treatment at a reasonable cost. Other individuals choose to go abroad for rehab because they went to get completely away from familiar temptations. It is also nice to recover in an exotic location because it makes the whole thing far more enjoyable. An example of international destination that people are choosing for rehab would be DARA Rehab. This facility is based on the tropical island of Koh Chang in Thailand. Those who are attending this program begin their recovery in one of the most beautiful locations on the planet. DARA is considered to be the leading addiction treatment facility in Asia, but the cost of treatment is very reasonable when compared to the west. They charge considerably less than $10,000 USD for an all-inclusive 28-day treatment program. 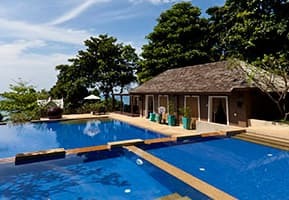 It would not be possible to find this type of luxury rehab facility in North America or Europe for that price, and this explains why so many people are now willing to make the trip to Thailand in order to escape their addiction. Paying for rehab can be a financial strain for many people, and their insurance may not cover the type of treatment they are looking for. There are free drug and alcohol rehab options in the US, but there is often a long waiting list and the individual will need to be assessed to decide if they are entitled to this. The reality is that there is no such a thing as free treatment, and if the individual is unable to afford it then the money needs to come from taxed. In many parts of the US the funds available for state funded rehab are not sufficient to meet the need for it. The facilities that the state funded individual will end up tend to be high quality, but this person will probably have little choice about where their sent. They might also have a long wait before a place become available for them in rehab. Addiction rehab can be expensive, and in many instances it will be public taxes paying for it. This has led to questions about the cost-effectiveness of sending people to rehab. According to a report issued by the US Department of Health and Human Services the benefits of treatment far outweigh the costs – by a factor of 7 to 1. This is because the economic cost of alcohol abuse is 184.6 billion dollars (this is based on figures from 1998 so the figure may well be higher now). This report goes on to show how every $100,000 spent on addiction treatment saves $487,000 on health care costs and $700,000 on money needed for law enforcement. * The money that the individual saves from not using alcohol and drugs will eventually cover the cost of this treatment. * By paying for rehab the individual is investing in their future. This should put them in the right mindset for making their aspirations a reality. * The purpose of rehab is to give the individual the tools they will need to make it in sobriety. It is possible for people to pick up many of these tools without help, but it is much harder to do so. * The first few weeks of recovery can be a real struggle for those individuals who are going it alone – it can be hard to fight off the cravings. By going to rehab the individual is supported through this crucial time. * Entering rehab means getting away from familiar temptations. The individual will be in a protected environment as they begin to rebuild their life. * Even those who are already sober may choose to enter rehab. This is because they realize that time spent in this facility will increase their chance of achieving lifelong sobriety. * Getting over an addiction is a serious business because if the individual fails it will have devastating implications for their future. It makes sense that the individual puts all their focus on overcoming the addiction and rehab will allow them to do this. * In rehab the individual will be surrounded by the resources they need to build a strong foundation for their future sobriety. Of course it will be up to each individual to make the best use of such resources. * The individual in one of these facilities will be constantly surrounded by other people who are on a similar path. This community united by a common purpose can greatly increase the motivation and strength of the individual. * Some people describe rehab as giving the individual a running start in recovery. By the time they get home the individual should already have a great deal of momentum going, and this will carry them forward. * Early recovery involves plenty of challenges for the individual to face. It may make the process easier if they are in comfortable surroundings – this may be why people choose to go through rehab in exotic locations. * Rehab usually offers the chance to experiment with different activities that the individual may pursue at home. This could involve health and spiritual pursuits such as yoga, tai chi, and meditation. * The individual can waste years of their life thinking about getting sober, and they may die before they get over this ambivalence. By attending rehab the individual is committing themselves to action. * Many of these programs will offer some form of aftercare service. This means that the individual will be supported long after they have left rehab. * Many people who attend these programs claim to have developed deep relationships with other clients. Even if they never see these people again it may still continue to have an impact on their life.